I haven’t wanted to write this blog for a couple of reasons. 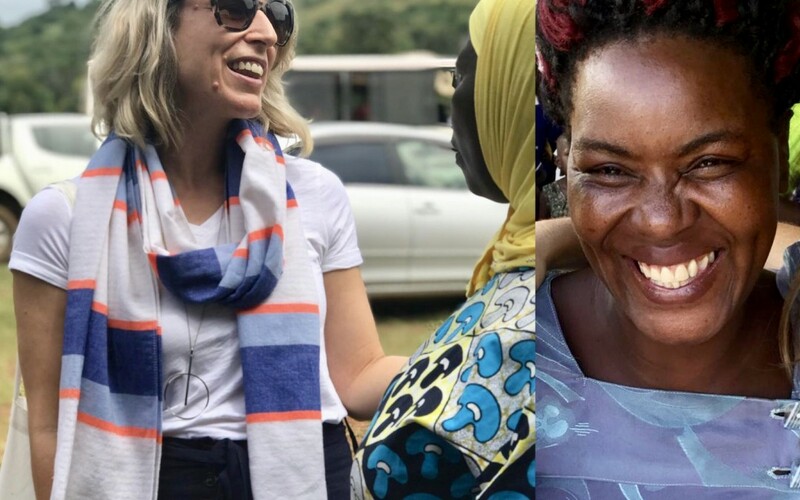 My trip to Uganda wasn’t what I or anyone would have expected and I didn’t want anyone’s pity – pity is counterintuitive to The Hunger Project’s (THP’s) philosophy. I also haven’t wanted to disappoint you. I have been carrying the weight of other’s expectations and have had to rationalise – if you donated, you donated not because of me. You donated to help empower our brothers and sisters on the other side of this beautiful planet. Two days into the trip and only a half a day out in the field, I fainted. THP took me to clinic where the doctor diagnosed me with malaria (which I didn’t reaaalllyyyy believe, but at this point I was at the doctor’s mercy). I was to receive three twelve hourly injections, which meant I was to be grounded the next day at the hotel waiting for the nurse to visit each time. I had hope I would join the remainder of the trippers the day after. Unfortunately, that Wednesday morning I felt so faint at breakfast that a joint decision was made – I needed to come home. Whilst my group travelled onwards, I travelled the five hours back to Kampala city with some of the THP Uganda team, who took me to a second clinic for a second opinion. Now I was told it was simply dehydration. Rest and replenish in the hotel, they said. My insurance company suggested the same until my original flight home on Saturday. So, I did. But I didn’t feel any better. Arriving home, the doctors here tested everything again. Vertigo, they said. And now a dodgy liver due to heavy malaria drugs. No one could have predicted this. I’ve never fainted before and I’ve only ever had vertigo once in my life, years and years (and years) ago. The main thing is, I’m completely fine. Yes, it is taking me a little while to recover but I am on my way to being healthy once again. I am super blessed. Super, super blessed. I was confused. I was disappointed. I was sad. And I was jealous. I longed to be out there alongside my new friends, experiencing the beauty of the people and viewing the work. But I’ve had to look for the lessons elsewhere. And there really was gold to be found. Kemi, Kate and Siv – The THP Australia team – nurtured me in a way that I could not have imagined. I felt like a nuisance, but their constant kind words and reassurance made me feel loved (especially when I was crying on the side of the road, post fainting). It was a great lesson in surrender and allowing people to catch you as you’re falling. Something I’m traditionally not very good at. The lessons on that have been coming a little harder each time. So, this time, I laid down (literally!). Daisy, Joyce, Belinda, Gerard, Simon and The THP Uganda team were JUST. SO. KIND. So very, very kind. They made me a total priority and again, made me feel loved. At times it was uncomfortable just how much care they showed me. I didn’t think I deserved it as a perfect stranger. But Ugandans don’t think that way. No one is a stranger to them. They felt a sense of duty to me, not because they had some prescribed duty of care, but because they see everyone as a friend and therefore their responsibility. The sense of community is palpable. Something I so desperately want to cultivate more of here. My new friends – Vanessa, Prue, Kiera, Rick, Iman, Rosli, Georgie and Emily – brought me their stories and compassionate cuddles back from the field. I relished hearing their experiences and felt privileged seeing their faces colour with all the love and sometimes, challenge. Even though I wasn’t able to be with them during the days, I never felt excluded or isolated from them. They are such a special crew and I’m so grateful to have met them. Zizi and Margaret and Mpigi Epicentre – I still had half a day in the field and it was still incredibly impactful. Once the dust settled, I was able to reflect on that day. The community from Mpigi, when we arrived, were excited! And loud! And grateful! We were greeted with dancing and music and hugs and questions and curiosity. They greeted us with, “You are welcome, you are welcome,” over and over and over again. I love words. I take extra note of them. This greeting is small but it’s actually quite significant. These words envelope you, they invite you in and they already, in the first instance, take care of you. Exactly like the people. They hold you in high esteem, not because of any title or dictated social hierarchy, but because you’re human. They assume equality. And they assume you are worthy of their respect – straight away. There is no hoop you have to jump through first, no judgment you have to get past, nothing you have to prove. They love you from the start. My God, if we could all be this way. When I answered, “I’m not still at school, but I teach”, she clutched her heart and widened her eyes. “Me too. I am a teacher!” and held out her hand for me to shake it. It was the sweetest moment in recognising even more common ground between us. We went on to tour the epicentre and visited the 79 children who were in school, the clinic where nursing mothers could now come to ensure their babies were healthy and vaccinated, the lab where medical test results were analysed and medications dispensed, the bank where micro finance loans were granted and the community centre where the people gathered. When the chairman spoke, again, the words were something to note. He was sure that our partnership was going to produce ‘wonderful, wonderful’ results. He spoke from a pure place. And even though he spoke solemnly, he spoke with passion and positivity. His humility made me want to cry. Not only will her story remain with me, but her spirit and her energy were stand out. I was in awe of her. She was remarkable. Life was just so beautiful to her. It’s amazing what half a day can do. It’s amazing what a week can do. We started to chat. Joseph was travelling to Doha, back to where he lived and worked. He was originally from Kampala but applied for his role overseas so that he could send money back to his family. His family consisted of 69 brothers and sisters (yes, you read that right). He had completed his Diploma in Business and was working as a cashier at KFC. He was sharing his plan with me. He was going to keep working so that he could save to do more business studies and then he would move on from KFC. After some time, he would then get a girlfriend. I loved hearing his story so much. It was his grounded determination, his pride and his certainty that this is what was going to happen. But it didn’t feel like he was in any rush either. I noticed that difference. He seemed very present with where he was at. Pride I felt was a theme amongst these beautiful people. They celebrated their achievement. I realised then how quickly I might move on from my own. Or how I’m always looking to the ‘next thing’, rather than admiring what’s right in front of me. So, more of that now too please. On my facebook post just before I left, I said I hoped to come home with more love in my heart to share. I do have that. It just didn’t show up in the way I thought it would. Nothing usually does. So, when I see you – let’s focus on the work and let’s focus on the love because that’s what’s important. What an inspiring story. (Not saying that because I’m your Dad). What an experience, one that many people should encounter. Reminds me in my younger days about being told to have faith, have hope and be charitable. No truer words have been spoken. Good on you and your crew of people for being good Samaritans. We live in a society of materialistic things rather than consider those who are less fortunate. Keep up the good work everyone.